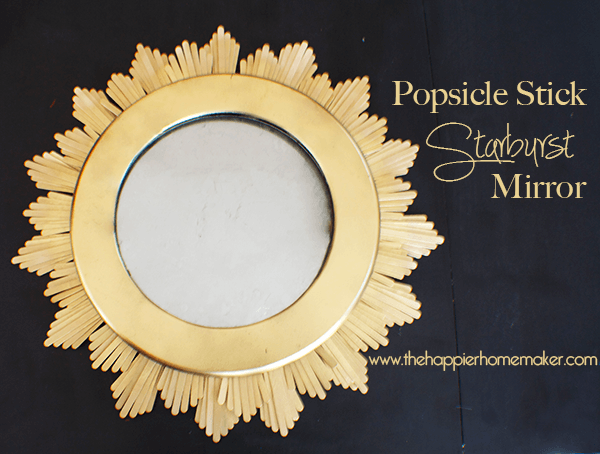 So what do you think about the whole starburst mirror fad? Have you hopped on board yet? 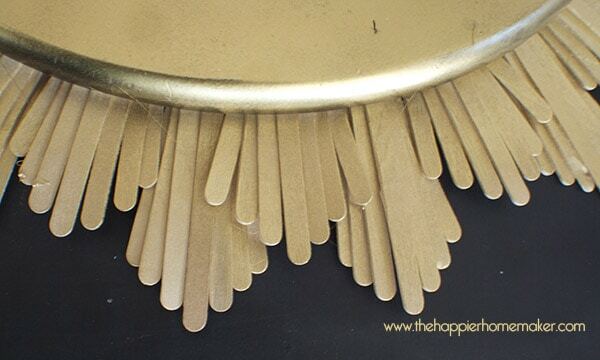 My husband has been resistant to go there but when I had the idea for this DIY version I had to try it! It all started with an old clock we had that I had set in my junk pile workspace in the garage to upcycle in some way. Over the holidays I received the new Ballard Designs catalog in the mail and as soon as I saw this startburst mirror I knew what I wanted to do! I started off with an old clock which I of course can’t find my before picture of! (Bad blogger!) I took the clock face out and sprayed the glass with Krylon Looking Glass spray paint. 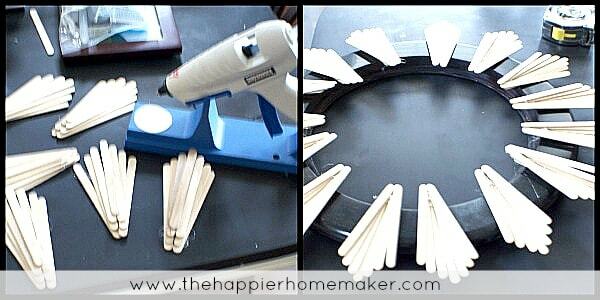 Meanwhile I used my fancy-dancy new cordless glue gun to create a big ol’ stack of little popsicle fans. Fun times. Once my fans were all dry I put my glass mirror back in the frame and started layering the popsicle stick fans onto the mirror. The first layer I glued on about halfway through the “fan” leaving spaces in between. Once it was dry I added the second layer behind it slightly higher. Once my mirror was assembled I covered the mirror portion with newspaper and sprayed the entire thing with Krylon ShortCuts in Gold Leaf. Y’all need to send me strength, I’m painting my master bathroom today and plan on revealing the full makeover on Friday (along with some gorgeous new blinds I got for my “trouble” window from Blinds.com!) After painting the downstairs bath and the sage of painting and stenciling the Master bedroom I am not really looking forward to painting again!